“Life,” a wise woman once said to me, “is a matter of contrasts”. Too true. We don’t appreciate silence if we haven’t experienced noise, we don’t enjoy a drink if we haven’t gone thirsty, and we don’t appreciate the outdoors if we haven’t been stuck inside for days and days and days and days. Ever wonder why the Boxing Day and New Year’s Day sales are such a time-honoured tradition? It’s because people have been lodged in the bosom of their family like a bullet lodged in a lung for what seems like six months; when an excuse presents itself to get out and see other people, a world beyond the suffocating perimeters of the family home, most of us are away like a newly-released wildebeeste. So yes it is partly a matter of contrasts: sleet stung our eyes and the wind whipped through our souls as we headed into exposed countryside. There was snow in the fields for miles around, and on the slushy road the slap of rubber soles, grunts of exertion, gasps of near-despair as mile followed weary mile and we hit that fearsome section three-quarters way home where the road suddenly ascends what feels like vertically and you think your heart is going to burst in your chest and come flying out like shrapnel, spraying fellow-competitors, if you don’t stop this punishment very very soon. But then suddenly you’re going down the long slope towards the finishing line, then you’ve hit the damp mat and are standing half-bent, hands on knees, wheezing like a whale, and local volunteers are pressing bananas and bottles of water and clipping the little run-timer chip from your shoe and you’re out of the cooooold and into the warmth of the hall and wolfing down sandwiches and buns and cake and tea and the happy atmosphere of a community that knows its own identity, its own strength, and has for twenty-five years delivered this radical seasonal tonic for hundreds of people. 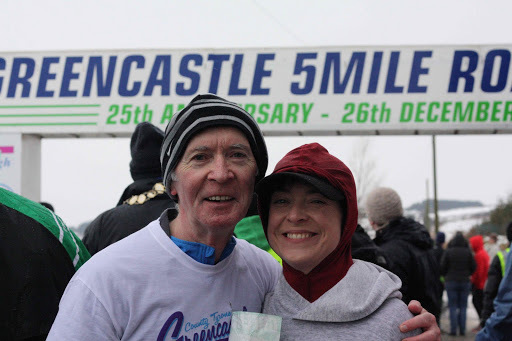 On the drive home with my dearest daughter I’m weary and heavy-eyed and spent but once more grateful to Greencastle and run organiser Oliver McCullagh. On a wind and snow-daubed hill-side they’ve worked their annual magic again.